Please follow our blog at its new location at the "refreshed" Glen Ellyn Media website. Thanks! COMING SOON: National Parenting Gifted children Week, the third week in July, co-sponsored by SENG and NAGC. It’s official – at least, you can find it at the “National Day Calendar” – but we’re not seeing much about it this year. How come? SENG is offering a webinar with psychologist Devon MacEachron on July 12. The topic: “Plato Parenting,” based on “uncovering and nourishing your child’s passions.” A fee applies. Find out more. The Washington Post covers tech tools that can assist in mental health, “from apps to avatars” they say. The article acknowledges the “wild west” nature of the field but points to several apps that, for example, help connect those in need to those who might help at any particular moment. Find the article. Two states have enacted laws requiring schools to provide mental health education as part of the curriculum. Find out more about how New York and Virginia hope to help students become aware of and deal with mental health issues. SOMETHING WE’D NOT THOUGHT OF – that’s the topic of a book on how the design of the world around them can influence and shape children. The New York Times asks the author of the book The Design of Childhood questions about her book. It’s a brief intro to the topic and book. The author says, “For anyone interested in child development, design or architecture, my book uncovers the thinking behind toys and children’s spaces and shows how parents, teachers and planners can foster kids’ independence and creativity.” Find the piece. ADDITUDE’S most popular article last week was evidently one titled “Face It – People with ADHD Are Wired Differently.” From the article: “The most current research on brain imaging is starting to let us trace the wiring, so we can untangle the misconceptions that experts, as well as those with ADHD, have about the disorder and the brain. Our new understanding of the brain promises to change the way we treat ADHD.” Find the article. Depression. A psychedelic concoction made from Amazonian plants is being tested as a potential help for treatment-resistant depression. Find a study write-up. IQ. Scientists have developed a way to predict a person’s intelligence based on resting-state fMRI scans. Find the study write-up. Anxiety. Most young people (78 percent) treated for anxiety disorders do not remain anxiety-free. Find the study write-up. We wrote last week about a Michigan judge who dismissed a suit brought by students against Detroit schools claiming that conditions and outcomes in their schools violated their right to access to literacy. According to Chalkbeat, the decision will be appealed. You’ve heard about recent instances of people getting into trouble for selling bottled water while black (as a kid) and campaigning for public office while black (as an incumbent). USA Today reports the story of a young man whose situation we interpret as “being smart while black.” Despite that fact that he was the valedictorian of his graduating high school class at a public charter school in Rochester, New York, he was denied a chance to give a valedictory speech – possibly because of past run-ins with the school principal. The town’s mayor invited him to present his talk. Read more. 2eNEWSLETTER.COM. We recently moved our domain registration for 2eNewsletter.com to a new registrar and are getting some flaky results when we try to access the site. We suggest omitting "www" and using http://2enewsletter.com. We're working to resolve the issue. SUCCESS STORY. Perhaps you've heard of the RXBAR, protein bar developed by young entrepreneurs in the Chicago area and sold to Kellog's for lots of money. One of the entrepreneurs is profiled in Forbes, which brings out the fact that the young man is dyslexic; the author of the article writes that the young man was "long accustomed to everything being more difficult." Find the article. There's a wrinkle here. The young man, Peter Rahal, grew up across the street from our family in Glen Ellyn, Illinois. (His uncle was an Indy race car driver.) We say, good for him! DYSLEXIC ADVANTAGE has an article by a clinical psychologist on how parents and teachers can help with the social and emotional side of dyslexia. Find it. A SETBACK? A Michigan judge, ruling against a lawsuit brought by students in Detroit schools over their education, apparently thinks that a decent education is not a constitutional right. According to an article in The New York Times, the judge said that “access to literacy” — which he also referred to as a “minimally adequate education” — was not a fundamental right. Find the article. UNDERSTOOD offers a blog posting on how to respond when people ask whether ADHD is real; find it. Understood is also hosting on July 9 an expert chat titled "Early Signs of Reading Issues -- and What to Do." Find out more. TiLT PARENTING'S latest podcast is on "surviving and thriving over the summer break." Find it. 2e2. The video "2e2: Teaching the Twice Exceptional" is now available on DVD. Find the official preview as well as information about ordering at the producer's website. THE ANNUAL SENG CONFERENCE is later this month. If you'd like perspective on what attending the conference is like, check out a somewhat dated but probably still relevant article by this year's conference co-chair, Jane Hesslein. While her tips and suggestions were geared to the 2011 Seattle conference, keep in mind that San Diego, the site of this year's conference, makes transposing some of her tips (such as "get out on the water") easy. Find the perspective. ADVOCACY. In 2e Newsletter we sometimes highlight what individuals and groups have done (or can do) to boost awareness of and the rights of twice-exceptional children. A recent issue of The New York Times features an excerpt from a resource the Times publishes called "How to Participate In Politics." The excerpt, titled "How to Lobby Lawmakers," echoes and reinforces some of the tips we've relayed from @NAGCGIFTED Director of Government and Affiliate Relations William Knudsen. Find the excerpt (scroll down to 'How to Lobby Lawmakers")... and then consider how you might put the tips into action for the benefit of your family and the 2e community! ACHIEVEMENT GAP TO EXCELLENCE GAP. The New York Times offers an article on the "excellence gap." If you've been paying attention to NAGC recently you're heard the term; in fact, NAGC's executive director Rene Islas is quoted in the article. Here's a paragraph that might tell you whether you want to read it: "Now, with test-score gaps narrowing but remaining stubbornly persistent after years of efforts, some in the education field are taking a fresh look at programs for advanced students that once made them uneasy, driven by the same desire to help historically disadvantaged groups. They are concerned not just with the achievement gap, measured by average performance, but the 'excellence gap; they hope to get more students from diverse backgrounds to perform at elite levels." Find the article, and note the relatively sparing use of the term "gifted." DYSLEXIA. A dyslexic writer for Wired takes on a tour of her own personal journey, plus her investigations into the writing assistant Grammerly, fMRI research into brain activity during dyslexic interventions, eyetracking software to diagnose dyslexia, and more. One interesting quote from a researcher: "Research has shown that there are neurons that are literally tuned to [a particular] word. They own this word." Find the article, and thanks to Rich Weinfeld for pointing us to it. MORE ON DYSLEXIA. Sometimes we learn history from obituaries, as we did this week with the death notice of Diana King, She was, according to her obit, "...a master teacher who helped generations of students struggling to read fluently, write and spell — and being stigmatized for it — because of an often undiagnosed learning disability called dyslexia." An interview a few years ago captured her saying this: "We continue to see the tragedy of a bright child coming home from school in the second or third grade in tears — ‘I’m the dumbest kid in all of the second grade’ — and getting stomach aches before they go to school, and all of this totally unnecessary and totally preventable." Find the obit. EDUTOPIA offers tips for getting introverts to engage in class. Find them. UNDERSTOOD has an upcoming expert chat with Ellen Braaten on "Understanding Working Memory." The chat is on July 2 at 12 noon eastern time. Find out more. Causes of ADHD. "A study of 30,000 children from seven European countries found no association between prenatal exposure to air pollution and symptoms of attention-deficit and hyperactivity." Find the study write-up. School and IQ. "Children who have a higher early IQ are more likely to stay in school longer, according to a meta-analysis in the journal Psychological Science. But more importantly for teachers, for every year of education, students also gain on average one to five IQ points, with gains that continue into old age." Find the study write-up. ENDREW F STRIKES AGAIN. Education consultant Rich Weinfeld served as the expert witness for a 2e student in a case involving the appropriateness of the student's IEP and whether the local school district should pay for the student's placement at the private school to which the student's parents had moved him. According to Weinfeld, "The administrative law judge applied Endrew F throughout and concluded that a student who she had previously ruled was receiving FAPE, was not longer receiving FAPE by the Supreme Court's Endrew F standards. The result was a decision that the school district must fund a private placement that programs effectively for 2e students." You may find a copy of the 54-page decision online. A discussion of the case begins on page 26; the judge's orders are on page 53. Way to go, Rich! UNEXPECTED. From the Washington Post: "People who know Sef Scott know he doesn’t normally speak. The 17-year-old from Plano, Tex., has autism, and other than quoting lines from favorite movies, he is mostly nonverbal. So the members of the Plano Senior High School Class of 2018 — along with Sef’s relatives and even his father — were stunned June 9 when he took the mic and addressed his fellow graduates." Read more, and view the unexpected -- and moving -- speech. SPEAKING OF GRADUATION -- The New York Times solicited graduation advice from readers, with the caveat that the advice had to be under 50 words. One example: “Regardless of the walls you bump against during your roller-coaster ride, there will be moments in your life which bring you to tracks of clarity, where what you really want from life clicks.” Find the advice. AND ANOTHER SPEECH, this one from an emergency room doctor who writes about his grade school experiences, "I had to go to early classes for kids with learning disabilities and, in fact, I was the last kid in my class to be allowed to write with a ballpoint pen." Now practicing in the community where he grew up, he says he still hears this: “You’re a doctor? I thought you were stupid. Can I see some ID, a diploma, something like that?” Read more about the doctor and find some of his speech. SENG has scheduled a webinar for June 26 titled "The Importance of Supporting Parents and Families of Gifted/Talented and Twice-Exceptional Children and Youth." A fee applies. Find out more. SCIENCE, RESEARCH, all from Science Daily. Autism blood test. "One year after researchers published their work on a physiological test for autism, a follow-up study confirms its exceptional success in assessing whether a child is on the autism spectrum." Find the study write-up. Genes and psychiatric disorders. "Researchers explored the genetic connections between brain disorders at a scale far eclipsing previous work on the subject. The team determined that psychiatric disorders share many genetic variants, while neurological disorders (such as Parkinson's or Alzheimer's) appear more distinct. The results indicate that psychiatric disorders likely have important similarities at a molecular level, which current diagnostic categories do not reflect." Find the study write-up. Neurocircuits, treatment. "The findings of the studies highlight the complexity of brain inhibitory systems and the importance of taking a subtype-, circuit- and neuronal population-specific approach to develop future therapeutic strategies using cell type-specific drug delivery." Find the study write-up. BRAIN BALANCE CENTERS. If you're considering obtaining treatment from a Brain Balance Center for your child, you might be interested in a recent NPR story on the organization. We also pointed to psychologist Devon MacEachron's blog posting on this alternative therapy several weeks ago. EDUTOPIA presents a piece on self-advocacy for young people with LDs -- why it's important, what the research says, and how we can change things to allow young people to become better self-advocates. One "take-off" point: using the IEP as a learning experience for this skill. From the article: "Research shows that students who practice self-advocacy skills (those skills associated with understanding one’s rights and needs and communicating and acting on that understanding) and self-determination (the capacity to be the primary agent in one’s learning and life) have improved educational and life outcomes when compared to those who don’t." Find the article. A fact sheet to "get essential information about how sensory issues can affect kids" -- and to give to teachers. Find it. Pointers to what Understood calls "eight sensory-friendly games to help meet your child’s sensory needs." Find it. And "7 Tips for Taking Kids With Sensory Processing Issues to the Movies." Find the tips. EDUCATION POLICY, LAW. The Council for Exceptional Children's "Policy Insider" provides information on what education funding will look like for FY2019. Basically spending is unchanged from 2018, although it could be worse. Find out more. TiLT PARENTING's most recent podcast is a discussion with psychologist/author Dawn Huebner about her new book, Outsmarting Worry: An Older Kid’s Guide to Overcoming Anxiety. Find the podcast. ADHD meds. "Results of a prospective longitudinal cohort study published in Pediatrics suggest that long-term medication adherence among children with attention-deficit/hyperactivity disorder (ADHD) is correlated with treatment acceptance and parent perception of medication need." Find the study write-up. Southpaws and mental health treatment. "Treatment for the most common mental health problems could be ineffective or even detrimental to about 50 percent of the population, according to a radical new model of emotion in the brain." Find the study write-up. Vitamin, dietary supplements in young people. "A new study published in JAMA Pediatrics shows that since 2003, the use of alternative medicines, such as herbal products and nutraceuticals, among children has doubled. The University of Illinois at Chicago researchers who conducted the study cite an increased use of Omega-3 fatty acids and melatonin among adolescents ages 13 to 18 as the primary driver of the change, despite clinical recommendations against use of such supplements in children." Find the study write-up. AN IMPULSIVE, EXCITABLE 7-year-old is the focus of an advice column at the Washington Post. Mom says, "He was doing okay, but it gets worse as the school year winds down and they are doing more fun, less-structured activities. I can help him at home, but it seems like his excitability and inability to manage his emotions are getting worse as he gets older." The columnist reminds us that impulsivity is a hallmark of childhood and discusses the maturation process, then offers a plan for dealing with the issues. The plan includes getting some testing, involving the school, and more. Importantly, the columnist writes: "Know this exploration is not a way to change your son; instead this is what parents and caretakers do to support the child we have in front of us." Find the column. COLLEGE: NEED THAT ACT OR SAT? The University of Chicago is joining a few other institutions in eliminating the requirement that applicants submit ACT or SAT scores. According to USA Today, "The new policy, which is being implemented starting with the Class of 2023, is meant to help even the playing field for students coming from low-income and underrepresented communities, university officials said." Read more. CHILD MIND INSTITUTE. In light of a couple recent high-profile suicides, the Child Mind Institute reminds site visitors of its parent's guide to helping a child in distress, "What to Do If You're Worried About Suicide." Hopefully you're not in need of this, but here it is. WCGTC BIENNIAL CONFERENCE. Time flies, and the World Council for Gifted and Talented Children has announced the dates a location for its 2019 conference -- July 24-28 in Nashville, USA. Find out more. ADDITUDE points to an article posted on its site -- can't tell if it's new or not -- titled "Culture Vs. Biology: What Really Causes ADHD?" Their article "tease" invites the reader to "Contrast and compare the controversial new theory that our fast-paced, stressed-out, consumer-driven lives cause ADHD with other scientific evidence to the contrary." Find the article. Reading, dyslexia. From Newswise: "Using MRI measurements of the brain's neural connections, or “white matter,” UW researchers have shown that, in struggling readers, the neural circuitry strengthened — and their reading performance improved — after just eight weeks of a specialized tutoring program." Find the study write-up. Depression. From Science Daily: "A simple, in-office EEG-based test can help determine if a depressed patient will do better on antidepressants or talk therapy." Find the study write-up. Autism. From the Deccan Chronicle: "Children with ASD are more than twice as likely to suffer from a food allergy than children who do not have it, according to the study from the University of Iowa.." Find the study write-up. EDUCATION WEEK TEACHER contains a letter written by a teacher to her class at the end of the school year. In it, she addresses her "class clown," her "quiet one," her "daydreamers and slow workers," and others -- and seems to have kind, understanding, encouraging words for all of them. Her great attitude toward her students is summarized in one of her concluding lines: "I wish I had more time with all you to watch you grow into the best versions of yourselves." Find the letter. THE CONCEPT OF OVEREXCITABILITIES is part of the gifted/2e culture -- a ubiquitous topic at conferences, in articles, and in conversations in the gifted/2e community. There's just one problem: The research supporting the concept may not be that strong. Psychologist Devon MacEachron, in her most recent blog posting, examines the research and offers her perspective. MacEachron specializes in psychoeducational assessment and educational planning for children who are twice-exceptional. Read her blog. The author of the Homeschooling 2e blog reacted to MacEachron's article this way: "I KNOW overexcitabilities are real. I live with them." Find Homeschooling 2e. And if you're a believer in OEs, know that the 13th International Dabrowski Congress is scheduled for July 12-14 in the Chicago suburb of Naperville. Find out more. COACHING GIFTED COLLEGE STUDENTS is the topic of an article in Psychology Today by psychologist Dan Peters of California's Summit Center. In the article, he and colleague Paula Wilkes explore the issues that might affect gifted college students, how coaching can help, and the mechanics of the process. Find the article. SUPPORTING COLLEGE STUDENTS WITH ADHD is the topic of a recent article in the Research and Training Blog at Landmark College. The article covers pharmacological support, educational support, psychosocial support, and behavioral support. Landmark is a college that recruits students who learn differently. Find the article. TiLT PARENTING. If you're interested in finding out more about Debbie Reber's new book Differently Wired, check out a podcast at TiLT in which she discusses the book with a colleague. Find the podcast. MORE ON GROWTH MINDSET. Education Dive takes a look at recent research on the effectiveness of this concept/practice. Read more. UNDERSTOOD is offering an "experts chat" on the topic "How to Use and Incorporate Strengths in Your Child's IEP." The chat is scheduled for June 18. Find out more. EARLY BIRDS: The Learning Disabilities Association of America (LDA) has opened registration for next February's conference in Fort Worth, Texas. The organization says, "Join over 1,000 educators, researchers, practitioners, parents, adults with learning disabilities and others who have an interest in the field." Register early. FAILURE can be daunting to young people with the "gifted" label. The Atlantic writes that knowing how students like Einstein experienced failure can improve highschoolers' grades. The Teacher's College at Columbia University has creted the Education for Persistence and Innovation Center to study failure and success. The head of the center says that her main purpose "is to help students realize that failure is a normal part of the process of learning." Find the article. ADDITUDE WEBINAR. On June 26, ADDitude has scheduled a free webinar titled "Parent Different: Raising an Exceptional Child in a Conventional World." The presenter is Debbie Reber of TiLT, and author of the book Differently Wired. Find out more. UNDERSTOOD has posted what looks like a new article on changing from stimulant to non-stimulant medication or vice versa. Find the article. SMARTKIDS WITH LEARNING DISABILITIES has posted a new, short article titled "Best Sports for Your Child with ADHD." Find it. TiLT. Don't forget that Debbie Reber is on a U.S. book tour promoting Differently Wired. The schedule: June 15, Seattle, WA; June 18, Portland, OR; June 20, Campbell, CA; June 21, Washington D.C.; June 23, Naperville, IL; June 26, New York City; June 27, Maplewood, NJ. Find out more. AND FINALLY, THIS. The New York Times has what it calls The Learning Network, a site about teaching and learning which uses Times content. During the year, the Times solicits entries for an annual Student Editorial Contest, where, says the Times, "teenagers were invited to write on the issues they care about most." The Times has published excerpts from some of those essays, and they provide a fascinating look at what's on the minds of the authors. Find the excerpts. Defining Twice-Exceptionality, noting the varying definitions of 2e and offering a parent tool to "write your own 2e definition"
Life Outside of School, with information and tools to support your child's emotional needs, developing executive functioning skills, resources such as SENG, and more. This is a very impressive document. Our compliments to the Davidson Institute! UNCONDITIONAL LOVE IN THE CLASSROOM. At teacher describes at Education Week what it was like to try a certain kind of love for her students. "I wanted a love that could embrace unappealing characteristics and behaviors with humor, tranquility, and curiosity. It would not be transactional or affected by my students’ daily or cumulative decisions. It would accept that they would all disappoint me at various times, some more than others," the teacher wrote. It sounds difficult. The teacher would have to "go toward the most difficult students with additional compassion, rather than retreating in frustration when my initial attempts to change them failed." The change in mindset improved the teacher's experience... and students' experiences as well. Read more, and consider the implications for teaching this way to twice-exceptional students. The June "Gifted Resources Newsletter" from Australian Jo Freitag is out. Find it. Julie Skolnik writes about summer, her upcoming plans, articles she's found of interest, and an in-the-works October virtual conference titled "2 Days of 2e." Find the newsletter. And in TiLT's latest podcast, writes Debbie Reber, "we’re talking about bad behavior. Specifically, The Good News About Bad Behavior. That’s the name of a new book by journalist, author, speaker, and parent educator, Katherine Lewis, and in this episode, Katherine and I talk about what our kids’ behavior is telling us and how we as parents, teachers, and other adults in kids’ lives can best respond to it while encouraging our kids to develop into healthy adults." Find the podcast. EVENT. Next week is the Utah Association for Gifted Children summer conference, in Park City. Find out more. EDUCATION. We offer these items as perspective for the services our gifted and 2e students may get or not get. Education funding. In the U.S. we collectively spend over a half trillion dollars a year on education. Education Week explains factors affecting this flow of dollars. Find the article. Spending by state. Education Week also provides information on per-pupil funding by state. How does yours stack up? Find out. Why teachers are striking. The New York Times looks at the reasons teachers are protesting, going back to decisions made during the Great Recession. Find the article. ANXIETY. Here are some recently-published items on the topic of anxiety, a condition which is not uncommon among twice-exceptional children. An article from UConn says, "For anxiety, a single intervention is not enough." Find it. The Clay Center for Healthy Young Minds published an article by Ellen Braaten on generalized anxiety disorder. Find it. Science Daily says this: "Neuroscientists have identified a neural circuit in the amygdala, the brain's seat of emotion processing, that gives rise to anxiety. Their insight has revealed the critical role of a molecule called dynorphin, which could serve as a target for treatment of anxiety-related disorders..." Find it. SENDING A GIFTED KIDDO TO COLLEGE is the subject of a new post by psychologist Gail Post at "Gifted Challenges." She describes families unprepared for the competitive nature of college admissions; and the lack of appropriate guidance from school or even parents. She offers tips on helping a young person plan for college and finding colleges t hat offer the right fit. Find the blog, and be advised that you, dear parent, have some important responsibilities. Related to this is a post a month or so ago at Smart Kids with Learning Disabilities about the pitfalls of college for students with LDs; find it. Reuters Health reports on a study: "Researchers examined results from 54 studies of non-pharmaceutical ADHD treatments like cognitive behavioral therapy, parent training, special diets, and supplements like omega-3 fatty acids. Overall, these studies were too small, brief or varied in how they measured results for researchers to draw firm conclusions about which approaches might actually work for kids with ADHD." Read more. On the other hand, an article in the Orlando Sentinel described a family in which the parents wanted to avoid medication to treat ADHD, using therapies like a diet free of gluten, sugar, and dairy. The article says, "Most experts agree that the combination of medication and holistic approaches, including behavioral therapy, exercise and talk therapy, offer the strongest treatment plan for most children," and then goes on to quote experts who may prioritize yoga and herbal supplements above medications. Read more. And then there's the possibility of using virtual reality as an ADHD treatment to lessen distractibility. ADHD expert David Rabiner, in an analysis of a study involving VR, noted that while it might have improved task performance, it did not change parent ratings of ADHD symptoms -- this in contrast to studies involving medication. Read more. The upshot? Try to figure out what's right for your situation... with the guidance of a professional. MENTAL HEALTH issues are now "a leading cause of disease burden in children aged 5 to 14 years" in both Europe and the Americas, according to recent research. What's more, the prevalence is not decreasing, as it is with other preventable diseases. Read more. On the same topic, an article at Psychology Today suggests that integrative behavior health is a promising way to deal with mental health problems in young people. With this approach, behavioral interventions are delivered to children by a pediatrician. Read more. PAYING TEACHERS. In an interesting choice of headline wording, Education Week says that "Nearly Half of Public School Teachers Are Satisfied with their Salaries." Why the headline wasn't "More than Half of Public School Teachers Are Not Satisfied with their Salaries" we'll never know. On the same topic at the Washington Post, a headline says, "New polls find more Americans say teachers are underpaid -- and many would pay higher taxes to fix it." You can find out more about how much teachers get paid, and paid in your state -- at this link. LAST WEEK, TED.COM featured talks that might be of interest to that young person you raise or teach -- or to YOU. The Talk of the Week is by a young woman who at age 13 became the youngest winner of Google's Science Fair by inventing a "smart bandage" to track wound healing. And the Playlist of the Week consists of four talks on introversion, often a trait in the gifted/2e community. Of the four talks, one might appeal especially to young, would-be activists... and another especially to young tech geeks. NEED A SHRINK to diagnose or treat your twice-exceptional young one? You're likely to have a tough time finding one in most parts of the United States, according to a study by the American Academy of Child and Adolescent Psychiatry reported by Physician's Briefing. The AACAP has published a color-coded map showing the adequacy of psychiatrist-to-population coverage in all states, with green being "mostly sufficient," yellow being "high shortage," and red being "severe shortage." There are no green states. Most are red. Find the write-up and click on "Workforce Maps" to see the coverage. SMART KIDS WITH LEARNING DISABILITIES offers tips on preparing for college and paying for it, along with a "College Preparation Checklist." Find the resources. TiLT PARENTING'S Podcasat 110 is a conversation with 13yo Asher about learning and education. Says TiLT's Debbie Reber, "...we’ve been having lots of conversations about this ourselves lately and we thought it might be interesting to share it for the podcast. So today we talk about how Asher learns, what he thinks schools get wrong when it comes to supporting atypical learners, and what ideas he has for schools becoming more inclusive." Find the podcast. MANHATTAN SUMMER CAMP. Quad Manhattan provides summer programs for twice-exceptional K-10 children, and says there are still spaces available. The organizers offer to "Build psychosocial/emotional and executive functioning skills in a fun and talent-based 6 week program this summer." Find out more. LANDMARK PD. Landmark College offers a summer institute for those who educate "students who learn differently." Find out more. SENG is presenting one of its "mini-conferences" in Columbus, Ohio, on August 11. It's described this way: "A one day conference exploring the social & emotional needs of the gifted. Topics include, but are not limited to: supporting twice-exceptional students, empathy, mental health, gifted literary characters, using creativity as a window, facilitating dialogues, gratitude & growth, and what to do when a gifted student struggles in mastery learning." Find out more. ADHD RATING SCALES. If ADHD is a concern at your house, you might be interested in an article at Medical News Today explaining the different scales and what they measure. Find the article. AUTISM. A major study examining the fish-eating habits of pregnant women has found that they are not linked to autism or autistic traits in their children. Scientists looked at the assumption that mercury exposure during pregnancy is a major cause of autism using evidence from nearly 4,500 women who took part in the Children of the '90s study. Find the study write-up. ADHD. Increases in the rate of diagnosis of ADHD (and consequent medication prescriptions) has led to more mis-use of the meds and more calls to poison control centers. Read more. ADHD. Can the use of the drug DES by grandmothers increase the odds of ADHD in grandchildren two generations later? Yes, according to new research. ADHD. Can in-utero exposure to phthalates increase the risk of ADHD in children? Evidently. Read more. IQ. Does breastfeeding make a kid smarter? Probably not, according to new research. Read more. IQ. Does a dad's exercise provide brain benefits to his offspring? Looks like it might. Read more. 2e2: TEACHING THE TWICE EXCEPTIONAL. The official trailer for this documentary is now available on Vimeo, according to producer Tom Ropelewski. This sequel to "2e: Twice Exceptional" focuses on -- as the title suggests -- education. Find the trailer. SENG. Here's a chance to share in the resources that SENG offers to its members -- and to do it free of charge. A recent SENG email promotes a May 30th workshop on "Provocative teaming ideas that build hope for 2e students, parents, and educators" -- this in the context of meetings and conferences about topics such as IEPs. The presenter is educator/presenter/researcher Linda Collins. We didn't see information about the event on the SENG website (yet), but you can register online. MINDFULNESS FOR CHILDREN. The New York Times "Well" section recently included an article by that title, giving guidelines for the practice. Advice covers parents with infants; toddlers; young children; older children; and teenagers. Find the article, and don't forget what psychologist Devon MacEachron advised in her recent blog: that "...it’s not a “quick fix” but more of a 'lifestyle change' requiring a significant commitment to see results." SOCIAL MEDIA can "steal childhood," contends an article at Bloomberg.com. 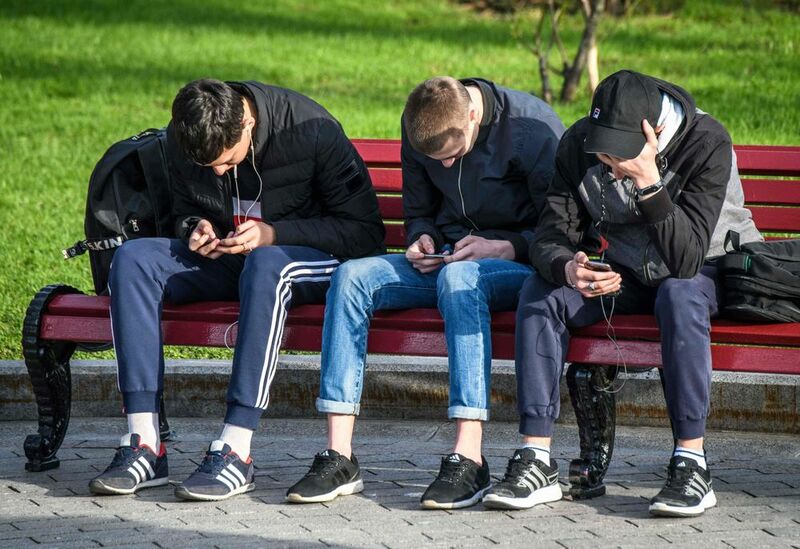 "Now researchers say social media could be making more teens depressed, and there’s plenty of parental panic about the attention-sapping effects of the smartphone age." We mentioned the research a few weeks ago, but this article takes a broader look at the problem, the research, what the government and social media companies might do, and even a "reference shelf" for further reading. If the scene depicted by a photo at the start of the article (see below) bothers you, check out the article. CIVIL RIGHTS FOR LDs are part of changes at the U.S. Department of Education that have some observers worried. The administration says the changes are for efficiency, including an effort to weed out "serial complainers." Others see, according to Education Week, "an abdication of the office for civil rights' duties." Read more and decide for yourself whether you should be worried about the civil rights of your gifted/LD young person. SELF-ADVOCACY is the topic of an upcoming event co-sponsored by the National Center for Learning Disabilities. Organizers say: "During the briefing, a group of distinguished panelists will offer actions that students, parents, community members, educators, and policymakers can take to ensure self-advocacy and self-determination are integrated into personalized learning systems." You may attend in person or watch the event online. Find out more. TAKING TO TASK. An eighth-grader in the Warren Township (New Jersey) schools took to task the district's board of education for its attitude and practices around neurodiversity -- in his case, autism. The young man, who has experience in both honors and special ed classes, delivered these messages: different is not deficient, and autism doesn't need a "cure." What he said was extraordinarily mature and highlighted his intellect and talents. He invoked Einstein, Mozart, and Grandin, and quoted experts in education. You'll enjoy his criticism of two particular actions by school administrators. Read more. FOLLOW-UP. Those who read the item last week about baseball and 2e in North Carolina will be interested in a follow-up article containing additional information, although the cause of the ineligibility ruling is still not clear. Find the latest coverage. DAVIDSON INSTITUTE. This organization's May newsletter is out, with news about the Intel Science and Engineering Fair, the World Science Festival, barriers for low-income gifted students, various Davidson initiatives, and education legislation/policy in the U.S. Find the newsletter. FEDS REQUEST "CLAWBACK." CEC reports this: "The Administration recently proposed to rescind $15.4 billion that Congress has already approved. The Committee for Education Funding (CEF) on behalf of 110 national education organizations and institutions including CEC, urged Congress to reject the Administration’s recession proposal. The recession package will cut $7 billion that would otherwise be available for education programs and other services funded through the Labor-HHS-Education appropriations bill for fiscal year 2019." Find the statement. FLEXSCHOOL, which currently operates two 2e-friendly campuses in the Northeast is gauging potential interest in the area of Maryland, DC, and Virginia. An exploratory information session is scheduled for June 7 in Rockville, Maryland. If you've been looking for a 2e-friendly grade 5-12 school in that area, check it out. TiLT is offering a pre-order special on the forthcoming book Differently Wired. The special includes four bonuses. Find out more. Separately, TiLT Podcast #109 is out, featuring Jonathan Fields, author of How to Live a Good Life. Debbie Reber says of the podcast, "I asked him to talk with us about his book and what we as parents raising different wired kids can learn about creating more purpose and meaning in our daily lives, even when we may sometimes feel as though we don’t have the bandwidth or energy or wherewithal to do so." Find the podcast. DEVON MACEACHRON has released Number 7 in her mythbusting series on alternative therapies for 2e learners, this one on mindfulness meditation. She reviews the research on mindfulness for kids. What does she think? Here's part of her conclusion: "I often recommend mindfulness meditation to the families of 2e learners I work with, as I do think it can help. I am concerned, though, that instruction and methodology can be a bit vague and many families may not know how best to go about it. Also, it’s not a 'quick fix' but more of a 'lifestyle change' requiring a significant commitment to see results." Read the full blog post. SENSORY PROCESSING ISSUES -- do they lessen with time? The Child Mind Institute explores that question with an article on its website. Find it. TECA, Twice Exceptional Children's Advocacy, has announced dates for its June online parent support groups, each of which will deal with transitions. Find out more. WRIGHTSLAW, observing Memorial Day, dedicates the current issue of Special Ed Advocate to "information and resources to help military families locate programs, services, and supports when advocating for exceptional family members." Find it. GROWTH MINDSET. Trendbuster? A new study found that 'growth mindset interventions,' or programs that teach students they can improve their intelligence with effort -- and therefore improve grades and test scores -- don't work for students in most circumstances. Find the study write-up. GETTING IT. A teacher writes in Education Week about students who have trouble paying attention. She says, "Some of my brightest, most creative, and capable minds are the ones who struggle to pay attention in class." Does she tell them, "listen better" or "focus"? Nope. Instead, she'll have an individual conversation with the student about their attention issues, with results she says "can be truly profound." Read more. CELEBRITIES, MENTAL HEALTH. US News notes, "It's become the new norm for stars to divulge vulnerabilities once kept closely guarded." The news organization gives plenty of examples and quotes a psychologist about the benefits of de-stigmatization and normalization by such revelations. The article also points to the campaign #MyYoungerSelf by the Child Mind Institute, currently returning for year two in Mental Health Awareness Month (May). Find the article. Find #MyYoungerSelf. ADDITUDE offers on its website an explanation of executive function disorder (EFD) and how it fits with ADHD and/or LDs. "When a professional evaluating a child or adult finds evidence of EFD, it is essential for her to clarify whether the disorder results in ADHD, LD, or both. Only then can the child or adult receive the appropriate treatment for his specific problem," says the article. Find it. TiLT BOOK TOUR. Debbie Reber has scheduled visits to a number of cities in the U.S. in June as part of the launch of her book Differently Wired: Raising an Exceptional Child in a Conventional World. According to Reber, "[T]he plan for tour stops is simple: meaningful discussions about how we can change the future for differently wired kids, community building through connection, crowdsourcing favorite local resources, no-holds-barred Q&A, and real, authentic conversations. (And potentially some special guests, TiLT swag giveaways, and yummy treats!)" We see four East Coast cities on her list, three West Coast cities -- and Chicago (actually Anderson's Bookshop in Naperville)! Find out more. SMART KIDS WITH LEARNING DISABILITIES offers "Why College Is Daunting for LD Students." The reasons include pressure, workload, personal responsibility, and seven more. Find out more about college traps to anticipate. UNDERSTOOD has an upcoming Expert Chat this Thursday titled "Your Child's Rights in the IEP Process." Find out more. CAMP SUMMIT WEST in Northern Calilfornia, for gifted (and 2e) kids, still has a few openings, according to its organizers. Find out more. TEACHER CONTRIBUTIONS. When you think about what teachers bring to the classroom as they try to make sure their students do well, consider that they also buy classroom supplies, on average about $500 worth per year -- on a salary that usually doesn't reflect their value to society in the first place. Read more. EDUCATION POLICY, PRACTICE, LAW, ADVOCACY. The items below are "big picture" items, things to think about when not immersed in IEPs, homework supervision, therapy sessions, medication monitoring, etc etc etc. Congress in the U.S. is evidently considering rolling back access to higher education for students with disabilities and for underserved students, according to the National Center for Learning Disabilities. NCLD gives you a way to take action on the matter. COPAA, the Council of Parent Advocates and Attorneys, observes the anniversary of the Brown vs. Board of Education decision. They quote part of the decision, which provides a vision of education worth contemplating. COPAA relates "Brown" to IDEA, and writes, "COPAA fights to make that promise of an inclusive, high quality education for students with disabilities become and remain a reality." COPAA also refers to current efforts to undermine equal access to education; find the statement. Chalkbeat writes about the disproportionate amount of disciplinary actions faced by students with disabilities in Colorado. Go to Chalkbeat. Finally, two former U.S. Secretaries of Education write about partisanship and the state of the U.S. education system today. They, too, note the crucial role of education in America. They write, "Higher expectations and strong standards — backed by federal policy that protects the enormous taxpayer investment in K-12 schools and higher education — are bipartisan concerns. Respect for teaching, and the accompanying need for better preparation and support for teachers, must be one unifying goal." Find the piece. LD IN THE WORKPLACE. When we saw the title of the article we figured it would be an interesting read: "8 Top Tips for People with Learning and Attention Issues to Find Success in the Workplace." It's in Forbes. And it starts off with the thoughts of David Flink, who has built Eye to Eye, an organization that helps people who learn differently... and that hires people who learn differently. It's about pride, self-acceptance, and more. The last tip: "Make Your Goal To Be Yourself (Not to Fit In)." Sound advice for any young person in the 2e community. Find the article. LABELS. They're good. They're bad. They're both. An educator/author writes in Education Week about various perspectives on labels and how they can help or hinder. He cites a study showing that the lack of labels can have a positive impact on educational achievement. In the end he quotes what he says is an old saying in education: "If it's good enough for a special education student, it should be good enough for any student." [And that statement, we think, would be equally as meaningful substituting "2e" for "special education."] The meaning? "Students shouldn't need a label to get good teaching and impactful interventions that will help them become better learners." Read more. GENDER AND TESTING. The type of question used to measure knowledge in a specific topic might give the advantage to either boys or girls, according to research written up at Journalist's Resource. Math questions? Multiple choice. Advantage, boys. Reading and language? "Constructed response" questions. Advantage, girls. Read more. GIFTED CHALLENGES. In our last blog we pointed to a post by psychologist Gail Post about the dangers of assuming that a condition like anxiety was the result of giftedness and not the result of another underlying cause that should be attended to. For Mental Health Awareness Month, Post has gathered a number of her writings about topics related to giftedness and various mental health topics. If you haven't been a regular reader of Post -- or if you'd like a refresher -- check out her blog. TiLT's newest podcast is "Dr. Laura Anderson on Gender Nonconformity and Differently Wired Kids." Find it. 2e2: TEACHING THE TWICE EXCEPTIONAL. If you're in LA, you can get a sneak preview of this film on May 20 at 2 pom at the United Talent Agency in Beverly Hills. Producer Tom Ropelewski says that admission is $10 per person, and all are welcome. A Q&A and short reception will follow the showing of the film. Seating is limited, he says, so to reserve a spot please RSVP to Jon Baum. ANXIETY IN TEENS AND KIDS. Here's another write-up on the role of social media in creating anxiety. EDUCATION POLICY, LAW. "Full funding" for IDEA. The Feds don't cough up the amounts they promised in order to pay for IDEA in states and districts across the country. Thanks to an interactive map, you can find the shortfall in your state -- money that should be there (but isn't) to help kids like yours. Find the map. ASD. A new study analyzing more than 1,000 brain scans reveals surprising new insights into brain networks in people with autism, after applying a new personalized approach to brain mapping. The new approach provides a way to examine the location of individual brain networks with more precision. Find the study write-up. OCD. A new study reports that people with obsessive-compulsive disorder (OCD) feel more distress when viewing images to provoke OCD-related emotions than their unaffected siblings. Although the unaffected siblings showed lower levels of distress, they had higher levels of brain activity in regions important for attention. The findings suggest that the family members may draw on additional brain resources to compensate for potential abnormalities in emotion regulation. Find the study write-up. ADHD. Physician's Briefing says this: "For children with attention-deficit/hyperactivity disorder (ADHD), participation in after-school activities (ASA) is associated with reduced odds of moderate-to-severe ADHD and having seven or more missed school days, according to a study..." Find out more. 2e, BASEBALL. Imagine you're a bright teen who is also non-verbal and suffers from anxiety. You find that being part of the high school baseball team is something you like a lot, that it gives you confidence, that you feel accepted. Now imagine that near the end of the baseball season, someone judges that you were ineligible to play because of academic reasons that aren't clear. As a result, your team is forced to forfeit all of the games it won during the season, and is denied a chance to participate in the state playoffs. How do you feel? It happened to a young man in North Carolina. Read more. EDUCATION DIVE did a quick wrap of recent 2e-related news, some of which you've already read here. They cover Scott Barry Kaufman's NPR interview; Understood's coverage of 2e; how some schools support 2e students; and the plight of minority 2e students. Go to Education Dive. TED TALK. On the weekly TED playlist we get was one titled "Why you should make useless things." A young woman inventor describes the toothbrush helmet she made, and the vegetable chopper and others -- none of which turned out to be useful. But usefulness wasn't the point. In the talk she says,"The true beauty of making useless things [is] this acknowledgment that you don't always know what the best answer is." For her, it was also an opportunity to deals with issues of performance anxiety, even though she achieved straight A's in middle and high school. Find the talk. DANA FOUNDATION. For brain mavens, the Dana Foundation offers an article called "The Skinny on Brains: Size Matters." The blurb says, "This month’s article examines the evolution of the neocortex, a part of the cerebral cortex concerned with sight and hearing in mammals, regarded as the most developed part of the cortex." Find the article. UNDERSTOOD offers "Tech Finder," information about apps and games for the child with learning and attention issues. You can search by issue (eg, reading), grade, and technology type. Find Tech Finder. TECH IN THE CLASSROOM. The writer at Jen Reviews has posted "9 Amazing Benefits of Technology in the Classroom" along with 18 ways to incorporate said technology. Example: improve knowledge retention using blended learning, or games. Find the article. SENG WEBINAR. On May 17 SENG has scheduled "Natural Approaches for Common Medical and Psychiatric Conditions." The session description says, "Many gifted and talented children and adults exhibit both medical and mental/emotional symptoms. Often these individuals are very sensitive and may not respond well to conventional treatments with numerous side effects..... Many integrative, functional, natural, holistic solutions are available and effective for these sensitive and bright G, T & 2E individuals." Find out more. 2e-FOCUSED PANEL DISCUSSION. The Institute for Educational Advancement is presenting a panel discussion on Tuesday, May 22, in Pasadena on the topic of twice-exceptionalities. All panelists are parents/professionals who have 2e kiddos. Find out more. AND FINALLY, THIS. An MD-turned-teacher reflects on the disparity in "respect" accorded each profession, the impediments to teacher respect and effectiveness, and some possible solutions. "As a pediatrician, it is hard for me to understand this widespread devaluation of those caring for and educating our nation’s children. Both teachers and doctors work tirelessly to decrease suffering and enhance well-being through essential and complementary methods." Read the perspective and consider the benefits to our kids and our country of a change in attitudes and practices. SCOTT BARRY KAUFMAN fans might enjoy an NPR interview with him about "ways schools and teachers can help these twice exceptional, or '2E,' students thrive." It's prompted by his recent book, an edited compilation on the topic of twice-exceptionality featuring many authors familiar to the readers of 2e Newsletter. Find the interview. SENSORY PROCESSING THERAPY. Psychologist Devon MacEachron, in Part 6 of her "Mythbusters" series. tackles the topic of the usefulness of sensory integration therapy for autism. She takes a conservative view. Read "Mythbusters." MISDIAGNOSIS? OR REAL DIAGNOSIS? Psychologist Gail Post starts off a recent blog entry this way: "...while gifted intelligence and social/emotional issues can provoke their own set of unique troubles, sometimes... sometimes... the issue is a mental health problem." Don't ignore symptoms or simply attribute them to giftedness, she urges, and get help when needed. Read more. BREAKTHROUGHS IN TWICE-EXCEPTIONAL EDUCATION starts today in Manhattan. (Find out more.) Julie Skolnick, of With Understanding Comes Calm, is there and promises live Facebook interviews with presenters and attendees. To get the flavor of the event, check out Julie's Facebook page. SPRING SALE. Until May 15, our "Spotlight on 2e" series booklets are on sale. See our website. Paid newsletter subscribers, check your inbox for even better prices. HOW FAR WE'VE COME is Jen the Blogger's look-back (in apparent astonishment) at her experiences with 2e kidsos (her own) over the past decade or two. If you're just starting on your 2e journey, this post is definitely something you want to read. Yes, things can turn out well. Find it. TiLT PARENTING's newest podcast is about Eye to Eye and its mission of matching mentors to kiddos with learning challenges. Eye to Eye has released an app which, according to TiLT, makes "Eye to Eye’s mentoring and advocacy skill building program accessible to kids from around the world." Find the podcast. DOES SOCIAL MEDIA CAUSE DEPRESSION? That's the question addressed this week in an article at the site of the Child Mind Institute. As the article notes in its opening paragraph, "In several recent studies, teenage and young adult users who spend the most time on Instagram, Facebook and other platforms were shown to have a substantially (from 13 to 66 percent) higher rate of reported depression than those who spent the least time." Read more. NAEP REPORT CARD. You've probably seen references to "The Nation's Report Card" on educational progress released recently. One part of the report card deals with the progress of students with disabilities. Smart Kids with Learning Disabilities gives a quick snapshot of the lack of progress there. Read it. STUDENT SELF-ADVOCACY is the topic of a blog entry at the site of the Landmark College Institute for Research and Training (LCIRT). At Landmark College, self-advocacy is built into the curriculum as a "student learning outcome" for year one. Read the blog. Separately, the application deadline for LCIRT summer PD courses in June 17. Find out more. ASK FOR A SPECIFIC TEACHER for your child with learning issues? Understood offers advice for parents tempted to do that. Find the advice. COPAA, the Council of Parent Attorneys and Advocates, has released its annual report, covering its mission and goals, structure, activities, and financials. Find it. GIFTED RESOURCES NEWSLETTER. Jo Freitag's May edition is out. Her Australia-based organization is "an independent not for profit information service which aims to provide news of support groups, conferences, lectures, workshops, programs and resources relating to giftedness and 2e issues which are available online and face to face." Find the newsletter. NAGC recently announced the release of a "microcredential" to help educators recognize indicators of potential giftedness in students in traditionally underrepresented populations. NAGC has three more microcrentials in development: for supporting social-emotional development in the gifted; for implementing evidence-based instructional practices; and for implementing the appropriate level of challenge to support gifted students. Find out more. NATIONAL TEACHER APPRECIATION DAY is May 8, part of Teacher Appreciation Week. If you know a teacher who has helped that great 2e kiddo you know, please take a moment to express your appreciation. The PTA has some suggestions; so does the National Education Association. To borrow Nike's expression, just do it! READING SUGGESTION. A friend in the 2e community sent a suggestion for an article that engaged her. It was originally published by the National Joint Commission on Learning Disabilities in late 2016, and is titled "Learning Disabilities and Achieving High Quality Education Standards." Our friend calls the article, "both beautifully conceived, but also a comprehensive statement of expectations for high-quality education standards." See what you think. DEPRESSION RESEARCH. A news item from the Brain and Behavior Research Foundation: "Esketamine Reduced Suicidal Thoughts Within Hours of Treatment in Patients with Severe Depression." The drug is closely related to ketamine. Find the item. TiLT PARENTING. if you visit this site only for the podcasts, you're missing other resources for parents of "differently wired" kids. For example, Debbie Reber also offers "10 strategies for 2018"; information about her forthcoming "Differently Wired" book; and more. Find the resources. UNDERSTOOD EVENT. On Thursday, May 10, Understood is offering an expert chat titled "Focus on Strengths-based IEPs." The blurb for the event promises "resources to help you learn advocacy tips and strategies." Find out more. RESEARCH PARTICIPATION OPPORTUNITY. A doctoral candidate is looking for parents with at least two years of experience homeschooling gifted or 2e children to participate in a study. The purpose of this study is to explain the educational processes used by homeschooling families of gifted and twice-exceptional children. The educational processes include the curriculum, instructional methods, and structure used in homeschooling. The study will be conducted through online chat applications. Please contact the researcher directly for more information: Bridgette Whitlow-Spurlock at (719) 238-3443 or bwhitlowspurlock@liberty.edu. ENDREW F. "Anyway you slice it, it hasn't changed the trends. The same folks are still winning — the districts." That's what an education law expert says a year after the Endrew F decision supposedly gave a higher standard for special ed services provided by school districts; this is according to an Education Week article. Read more. MENTAL HEALTH MONTH -- that's May, a couple of our sources remind us. The Clay Center for Young Healthy Minds offers some resources for the occasion; find them. The American Academy of Child and Adolescent Psychiatry also notes the observation and points readers to its "Facts for Families Guide," with information on topics such as ADHD, depression, emotional distress, and more; find the "Facts." SMART KIDS WITH LEARNING DISABILITIES says, "Each year Smart Kids with Learning Disabilities honors a group of truly outstanding young people who, despite their learning challenges, are making a difference in their schools and communities through their remarkable achievements." Meet the 2018 honorees, who achieve as they deal with issues such as dyslexia, dysgraphia, ADHD, and more. FOR THE SUMMER. Bright Math Camp, at the University of Ottawa, is back again, according to its organizer. It's a not-for-profit camp for the promotion of mathematics. Find out more. TEACHER PD: PARENT INPUT. Understood offers a parent toolkit titled "How to Ask for Schoolwide Teacher Training to Help Kids with Learning and Attention Issues." Topics covered include FAQs about teacher PD; strength-based IEPs; multi-tier systems of support; personalized learning; and more. Find the toolkit. TiLT PARENTING's Podcast #106 focuses on sibling dynamics, and features author and parent coach Julie King. Find the podcast. SENG reminds us that early-bird pricing for its July conference ends this month. If you're thinking about attending this conference (in San Diego this year), find out more. GIFTED AND DISTRACTIBLE, the May edition, is now out. Julie Skolnick provides 2e-centered articles, information about events, and book suggestions. Find the newsletter. Education Week published "Daydreaming or Distracted? What Teachers Misunderstand about ADHD." Find it. Edutopia published "Setting Students with ADHD Up for Success," strategies for educators. Find it. FINDING "HIDDEN" GIFTEDNESS. The state of Tennessee and the National Association for Gifted Children are piloting a "micro-credential" program to help teachers identify giftedness in traditionally underrepresented groups, such as students who are from disadvantaged backgrounds, non-English-speaking backgrounds, racial/ethnic minorities... and, yes, students with learning disabilities. The four- to six-week program is one of dozens of PD credentials offered by Tennessee. Read more at Education Week or at the site of NAGC. The fourth annual conference "Breakthroughs in Twice-Exceptional Education" is scheduled in Manhattan for May 10-12 at Cooper Union. It's sponsored by the 2e Study Center at the Quad and Quad Preparatory School. Find out more. TECA and SENG are putting on a Long Island (New York) regional conference on May 18. Organizers promise a day of speakers on giftedness and 2e; a screening of "2e2: Teaching the Twice-Exceptional"; and SMPG (SENG Model Parent Group) training. Find out more. LDA CALL FOR SPEAKERS. The Learning Disabilities Association of America has issued a call for proposals for presentations at its February, 2019, annual conference. Find out more. LDA AND UNDERSTOOD have issued a guideline on differentiating ADHD and sensory processing issues. The organizations say, "Does your child have issues with personal space, sitting still, or feeling comfortable in public places? It could be sensory processing issues, ADHD, or a combination of both." Go to the guideline. A global study has found 44 genetic risk factors for major depression, according to Reuters. Read more. Another recent study identified 90 genes linked to depressions; read more. Both studies were done in the UK. Researchers believe they have uncovered a method that could be useful in predicting a depressed patient's treatment prognosis, prior to starting treatment. The predictions are based on "neural markers," activity in specific brain regions. Read more. SUMMER PD. The Belin-Blank Center at the University of Iowa offers summer professional development opportunities for educators of the gifted. (The Center is "2e-aware.") Find out more. MYTHS OF GIFTEDNESS. The South China Morning Post recently published "Five Myths of Giftedness in Children." One myth is titled "The Gifted Only Myth." From the article: "Similar to the myth that giftedness is not a special need is the idea that learning difficulties and giftedness fall on one spectrum together. That you could draw a single line from learning difficulties to giftedness and every child would fall somewhere on that line." (You know how workable that concept is.) Read more. #MYYOUNGERSELF. Last year the Child Mind Institute featured a number of grown-up achievers who shared "messages of hope" with their younger selves. Now the Institute promises this: "The campaign returns on May 1st, bringing together more than three dozen actors, Olympians, authors, comedians, businesspeople and others to share personal videos throughout the month, speaking movingly to their younger selves about growing up with a mental health or learning disorder." Find out more. AUTISM RESOURCE. The National Autism Academy makes available free videos covering "The Seven Emotional Secrets of Parents with Autistic Children." A sample objective: learn "[h]ow to approach your Individualized Education Plan (IEP) meeting with power and persuasion to get the resources your child needs." Learn more about the videos. SUMMER CAMP RESOURCE. The Whole Child Academy on Long Island is offering a variety of summer sessions for gifted and 2e kiddos under the heading "Mentoring Scientific Minds. Find out more.